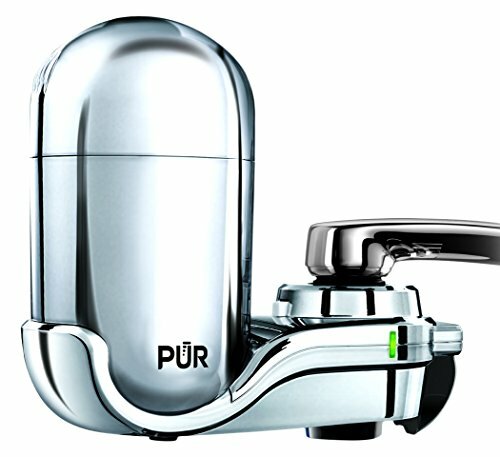 2 How Tap Faucet Water Filters Work? 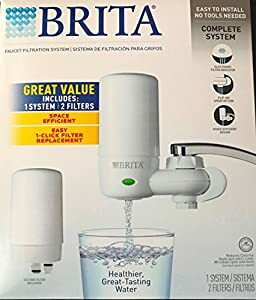 4.1 What Features Should I Look For In a Faucet Water Filter? Faucet water filtration systems offer an inexpensive way of drinking healthy water. They are easy to install, and they are effective at removing contaminants from the water. But did you know that some of the only use a filter cartridge once every three months? 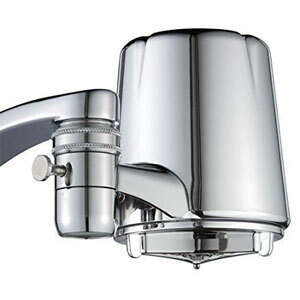 In the following article, we present the best faucet water filters. Don’t you know how to tell an efficient faucet water filter from a bad one? You came to the right place. 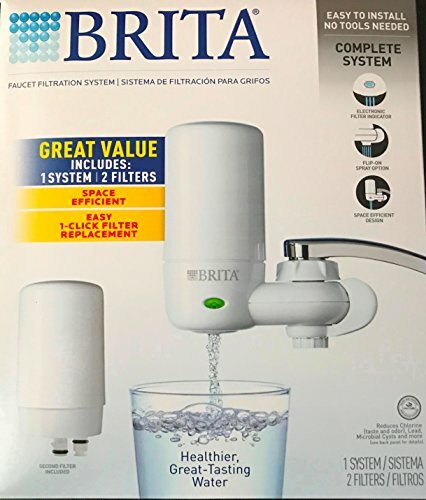 Further, in the faucet water filter reviews, we explain how these filters work, how to install them, and the benefits of using them. Faucet water filters are also an environmentally-friendly way of getting your drinking water. Unlike other filter technologies, these models do not produce wastewater, and they don’t need electricity to work. This is the cheapest water filter we included on our list. With a low starting price and a high overall rating, this is a water filter you should take into consideration. The system is easy to install, and it has a 100-gallon filtering capacity, so you can change the filters once every 2 months tops. The water filter is very effective. It will filter out most of the contaminants in your water and you will be able to tell the difference as soon as you finish installing it. The filter is certified to reduce the sediment, bacteria, microorganisms, cysts, chlorine, and many other contaminants from your water. The filter is also very good at removing any foul odors or tastes from the water. Cheap – Despite its effectiveness and good water production, this is the cheapest filter on our list. Even though some people might think the filter is not as good as the more expensive ones, our tests actually proved the contrary. Instruction Manual Doesn’t Mention Teflon Tape – This model comes with everything you need for the installation, including Teflon tape. However, the instruction manual doesn’t mention when you should apply the tape. Keep in mind that the unit will leak without it. This model provides a good water filtration solution for people who have a mildly polluted water source. The filter can be easily installed directly on your existing faucet, and it allows you to have a separate access to the filtered and unfiltered water. One of the advantages of using this water filter is the good water flow it produces. Unlike other water filters that cut back the water flow, this one actually increases it. The filtered water will have an increased pressure, so you will be able to fill recipients quickly. Another advantage is the light sensor it comes with. The sensor will notify you when it’s time to change the filters. When the light is green, the filters are still good. The yellow light appears when the filters will need changing soon, and the red one will only appear when you have to change the filters at once. Fast Water Flow – This water filter produces a fast water flow. This is a major advantage over its competition, and it makes the unit more functional. Filter Sensor Dies – Some customers complain that the light notification sensor signaling the filter change dies quickly. This water filter is one of the most efficient units in its category. The activated carbon charcoal filter it uses will remove most of the contaminants from your water. The carbon filter will reduce sediment, cysts, mercury, lead, and chlorine. The KDF55 particle filter will also remove fungi, scale, lime, mold, and bacteria. One of the advantages of using this water filter is its sturdy and durable construction. Unlike other filters that are made out of flimsy cheap plastic, this model is made out of food-grade ABS plastic which is also BPA-free. Another advantage is the increased longevity of the filters it uses. This model can filter up to 200 gallons of water before you have to change the filters, so you will only need to change them once every 4 – 5 months or so. The filter cartridge is very easy to replace, and the whole process shouldn’t take you more than 3 minutes. Poor Instruction Manual – Even though the installation is quick and easy, the instructions manual could be better. This is the most popular water filter in its category, and it’s currently the best-selling model on Amazon. This water filter provides a nice and steady flow of water, and it comes at an attractive price. The main advantage of using this water filter is its effectiveness. The filter is capable of removing over 70 different contaminants, and it’s very efficient. This model is certified to remove up to 99% of the lead, 96% of the mercury, and 92% of the pesticides contaminating your water. Another advantage is the easy installation. You can connect and remove the filter to your faucet in a matter of minutes, so you can easily take it off when you need to. The filter is also made of top quality materials, so it will last for a long time. Great Value – This product produces clean and crisp water, so you will benefit from the health effects of purified water at a low buying price. The price – effectiveness ratio is very good for this model. Plastic Housing Can Break – This model comes with a sturdy looking plastic housing. Unfortunately, the housing is prone to breaks, so be careful when manipulating the filter. The InstaPure water filter is a good choice for every home. The water filter comes with everything you need for the installation, and it can be mounted on most kitchen faucet models. 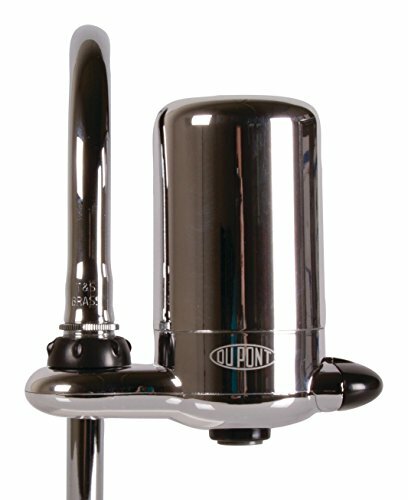 Thanks to its chrome finish, this water filter will blend right in with the rest of your fixtures and appliances. One of the advantages of using this model is its ease of use. The filter can be instantly turned on or off, so you can choose when to use filtered or unfiltered water. This feature also allows you to fully appreciate the difference in taste between the two types of water. Unlike other filters, this model is sleek and easy to install so it will be very easy to mount on your faucet. Another advantage is that the filters are also cheap. You have to change them once every three months, but you don’t have to break the bank to do it. 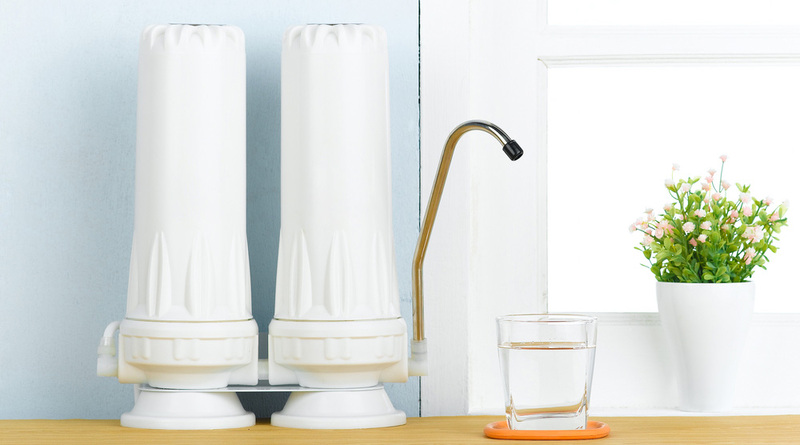 Durable – Not only does this water filter look good, but it’s very durable as well. If you’re careful when you use it and don’t bust it up when you change the filters, the water filter should last a very long time. Hot Water Ruins It – Don’t use the filter when you’re running hot water because it can ruin it. This is another very popular choice we included on our list. The Culligan is also one of the best-rated units you’ll find in its category on Amazon. And we’ll be honest with you, after taking a closer look at how it filters the water, all the high ratings are justified. This water filter also has one of the simplest installation processes from the models we reviewed. After the installation, you can choose when to filter the water and when not to. One of the advantages of using this filter is the long warranty period it comes with. With a 2-year warranty period, it’s clear that the manufacturer is confident enough in this model to believe it will last longer. Another advantage is that the filter comes with two separate finishes, so you can make sure it will match your other appliances and fixtures. Great Tasting Water – The Culligan water filter produces great tasting water. With most of the contaminants gone from the water, there will barely be a difference between the one exiting the faucet and bottled mineral water. Difficult Filter Change – Many customers complain that changing the filters on this system is a difficult task. 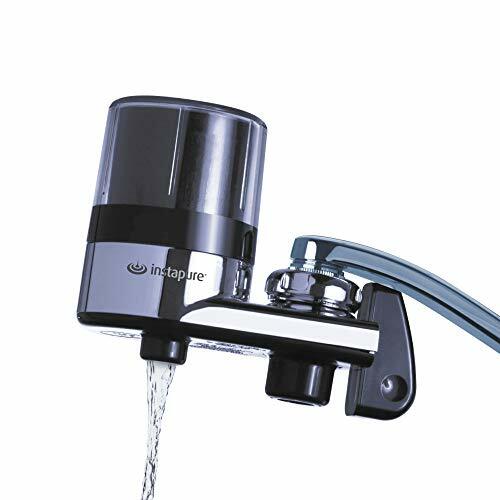 How Tap Faucet Water Filters Work? Before we start explaining how faucet filters work, we have to make sure you’re aware of something. Faucet water filters filter the water, but they do not purify it. Many people consider the two terms synonymous, but they’re actually not the same thing. 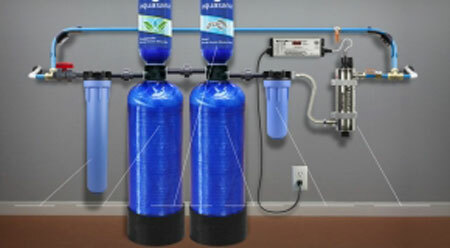 Just to be clear, water filters like these produce filtered water, while reverse osmosis systems produce pure water. The difference between the two is notable, but here is a quick explanation of what’s different. When you use a water purifier, you don’t have to use it on treated water. You can simply use it on untested well water, or even on a water you previously know to be contaminated. Water purifiers like reverse osmosis systems will remove up to 99% of the contaminants in the water. Actually, just to be called a water purifying system, a unit has to be capable of removing at least 95% of the contaminants. Water filters shouldn’t be used on highly contaminated or untreated water sources because they don’t work that way. When you use a water filter like a faucet water filter system, you actually improve the water’s quality by up to 20%. This automatically means the water will be healthier than it was before the filtration, but it doesn’t mean it will be good for you. A highly contaminated water source might still be dangerous for your health even if you filter it. 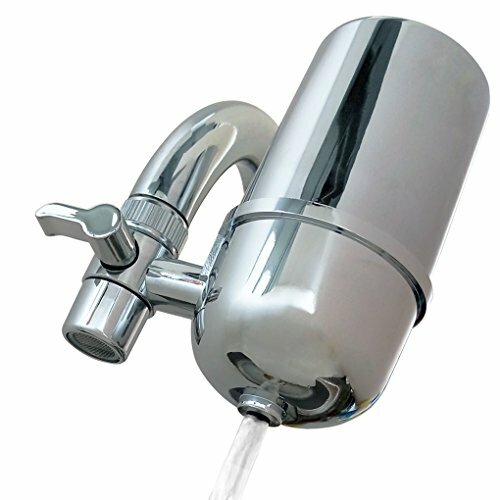 Faucet water filters usually rely on a cartridge filter. 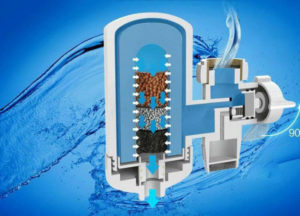 The cartridge has more components that work together to filter out the contaminants in the water. While there might be some differences between models made by various manufacturers, most of them employ the same components and work in a similar way. 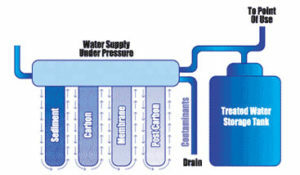 Sediment Removal – This is the first step in the filtration process, and it’s usually done with the help of a non-woven screen wrapped around the cartridge. The screen is specially designed to stop large and small particles like rust, dirt, debris, and sand. Activated Carbon Block – Now that the water is mostly clear of any sediment and rust, it reaches the activated carbon block. The activated carbon has a porous surface, filled with nooks and crannies. When the water flows through the block, the contaminants in the water are trapped in these crannies through a process called adsorption. Once in a while, the porous surface of the activated carbon gets filled with contaminants so its efficiency will drop. This is why you should always make sure you use clean filters. Most manufacturers nowadays use treated activated carbon for their cartridges. This means that another substance is impregnated into the carbon to give it some particular features. Sometimes silver is added to kill off any fungi or bacteria that might escape the carbon filter. Other times some other chemicals might be used, but their purpose would be similar. Chemical Removal – The next step in the filtration process ensures that the chemical contamination level is reduced. Activated carbon filters are very good at removing usual contaminants like chlorine, but they can’t filter out chemicals like heavy metals or even magnesium and calcium. This is why most manufacturers make sure this filter takes out other contaminants that might find their way into your water source, like lead, mercury, or nitrites and nitrates. This filter also blocks out the bad odors and tastes. The amount of time the water stays in contact with the cartridge filter determines how many contaminants are trapped. If the water has a longer contact with the activated carbon filter, more contaminants will be trapped in the porous surface of the filter. This is why many faucet water filters will produce a slower water flow. There are many benefits of using a faucet water filter. Healthier Water – Even though these are just water filters, not purifiers, they will produce a healthier water than what usually comes out of your faucet. 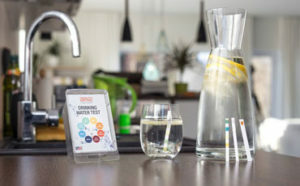 It doesn’t matter if you are connected to a municipal water source or a tested well, the filters will block many contaminants from entering your drinking water. Easy Install – Some people avoid buying water filters because they’re afraid they won’t know how to install them. This is not a problem for faucet water filters. These filters are easy to install, and most people will be able to install them by themselves in under 5 minutes. 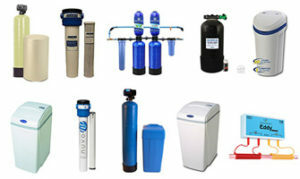 No Chlorine – It doesn’t matter which faucet water filter model you choose, it will remove the chlorine from the water. Chlorine is used as a disinfectant in municipal water filtering facilities. However, chlorine has been linked to a number of diseases in the past decade, so it would be better to avoid ingesting it. No Foul Smell or Taste – Faucet water filters are very good at removing weird smells or tastes from the water. If you think the water coming out your faucet has a funny taste or smell, these are the filters for you. Blocks Usual Microorganisms – A faucet water filter will stop Giardia and Cryptosporidium from reaching your drinking water. Ingesting these microorganisms might lead to a rapid deterioration of your health. People with giardiasis might experience symptoms for up to 6 weeks. 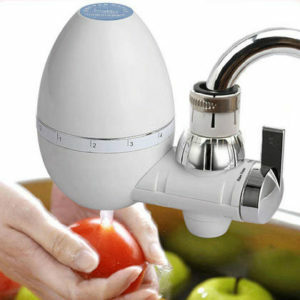 Environmentally Friendly – Faucet water filters do not waste any water during the filtration process. They also don’t need electricity to run, so they don’t have a carbon footprint. These filters are also more environmentally friendly than buying bottled water because they don’t use plastic containers. No Plastic – Not only will be reducing your plastic consumption be good for the environment, but it will also be healthier. Not all mineral water manufacturers use food grade plastic for their containers, so after some time, the plastic might leak into the water. Drinking this water can lead to some serious health issues. No Nitrates and Nitrites – These filters are very efficient at removing nitrates and nitrites from your water source. These compounds are usually found in pesticides and insecticides, and they can accidentally leak into your water source. Ingesting these compounds is especially dangerous for the young and elderly. Blocks Heavy Metals – Faucet water filters are very efficient at reducing the number of heavy metals present in your water. Heavy metals can leak into the water from the contaminated soil, but sometimes even the pipes distributing the water from the municipal source can contain some. Just because most faucet water filters work in a similar way doesn’t mean that they are built the same. Some of them have features others don’t. But which features are actually good for you? What Features Should I Look For In a Faucet Water Filter? Filter Change Sensor – Faucet water filters are low-maintenance units. However, one constant maintenance operation you will need to do regularly for every filter is the filter change. Having clean filters is essential if you want to drink clean water at all times. This is why it’s important to know when to change the filters before they get blocked by filth. A filter change sensor can help with that. Some models use a sensor which will notify you when the filters approach the changing period, while others will only notify you when the filter needs immediate change. It doesn’t matter which of the sensors your filter has, as long as it has one. If you don’t choose a filter with this kind of sensor, you will have to mark every change of filters you do. Filter Longevity – The longer your filters will last, the less frequent you will have to change them. This might not seem like a big advantage since the filter change usually doesn’t take more than 5 minutes, but it can be frustrating to have to change the filter every month. If you know you’re not very patient, it might be better to opt for a unit that needs a less frequent filter change from the start. 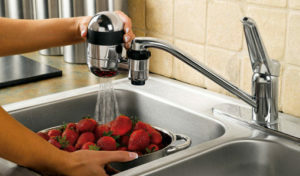 360-degree Swivel – Some faucet water filters don’t swivel at all, and this might be an inconvenience when you do the dishes, especially if you use larger pots or trays. Having a filter that swivels will remove this problem altogether. 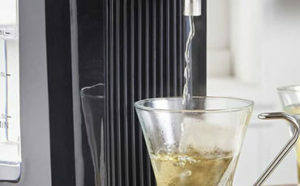 Different Finishes – Getting to pick the water filter’s finish will help you maintain the kitchen’s decor. Choose the same finish as your other appliances and fixtures, and the faucet will blend right into the kitchen’s design. Even though they are produced by different manufacturers, most faucet water filters have a similar installation process. Before you begin the installation, make sure you have an adjustable wrench and some Teflon tape close at hand. 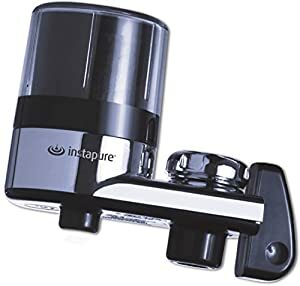 Most faucet water filters come with all the necessary components for the installation, and some of them will also come with Teflon tape, but it’s better to be prepared. Here’s how you install a faucet water filter. Remove the faucet’s aerator. The aerator might be very tightly screwed on, so make sure you use the adjustable wrench if you can’t twist it off by hand. Put the original aerator on top of the inserts that come in the water filter’s box to make sure you find the right one for your faucet. Screw the new insert aerator on the faucet. If the filter cartridge is not pre-assembled, insert it in the filter now. Turn on the water and let it running for at least 10 minutes before you taste the water. This will allow the filter to activate. Check for leaks. If there aren’t any, you’re all done. If anything is leaking, try fixing it by applying some Teflon tape. Changing the filter is done differently depending on the model and manufacturer. However, most of the times this operation shouldn’t take you more than 5 minutes. If you choose a faucet water filter that uses a filter change sensor, you should respect its indication and change its filters appropriately. Some manufacturers will also remind you via mail when it’s time to change the filters. If your faucet water filter doesn’t have a filter change indicator, you should always mark the date you changed the filters on your calendar. Most water filters come with a capacity indicator, so you know that it should last for about 100, 200, or more gallons but you don’t know how long that means. On average, an American household would consume up to 2 gallons of drinking water per person per day. So if you live in a household of three, that means 6 gallons per day. This means you will have to change a water filter with a capacity of 200 gallons roughly once every 30 days. This period might vary according to your consumption. If you notice limescale deposits on your faucet water filter, you can clean them using a clean rag and some vinegar or lime/lemon juice. Just fill a bowl of water with a mix of 1/2 water + 1/2 vinegar or lemon juice, dip the rag in the mix, and use it to remove the limescale. What Should I Do With The Used Filters? You should recycle the filters. Some manufacturers will send you a return shipping label so you can send them the used filter for recycling. If your filter’s manufacturer doesn’t offer this kind of services, look for a recycling campaign in your area. How Often Do I Have To Change The Filters? If your faucet water filter has a filter change indicator, you should follow its instructions. If it doesn’t, you should always keep track of how often you change the filters and change them accordingly. You should calculate the amount of water you filter in the first week of using the filter and use that as a reference so you can calculate how much water is filtered each week. Does My Water Filter Remove Limescale? 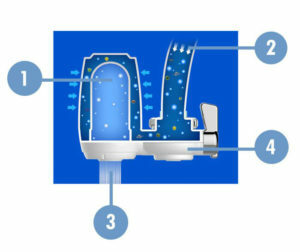 Each water filter is different, but usually, faucet water filters do not remove the calcium and magnesium from the water. Since these are the main components of limescale buildup, the answer is no. Faucet water filters are nowadays very effective at blocking and removing different contaminants from your water source. Some models are so technologically advanced that they remove more than 70 different contaminants, a thing possible only when using reverse osmosis systems in the past. Unlike other filtration systems, these models do not produce wastewater, which makes them cheaper to use, and more environmentally friendly. Their good filtering capacity and cheap price make them very valuable units. The best tap faucet water filters will remove most of the contaminants in your water, producing a better tasting water, similar to that of bottled water. We’re certain that after reading our faucet water filter reviews and the comprehensive buying guide we prepared, you’re ready to make an informed decision on which model is the right one for you.